I’ve joked about how I’m always the one who shows up at parties with a veggie platter and hummus — although, can you call it joking if it’s entirely serious? Whatever. This is a known, slightly amusing fact. Another interesting fact that you might not actually know? Not all hummus is made from chickpeas — there are a few other players on the market, like edamame, lentils, and, as we’ll see in this recipe, white beans (with carrots!). So, seriously, if you’ve got a hummus hater in your life (and I’ve known a few), it’s worth trying a few varieties, because, you know, when you change up the main ingredients and add various flavors, well, it really changes the game. 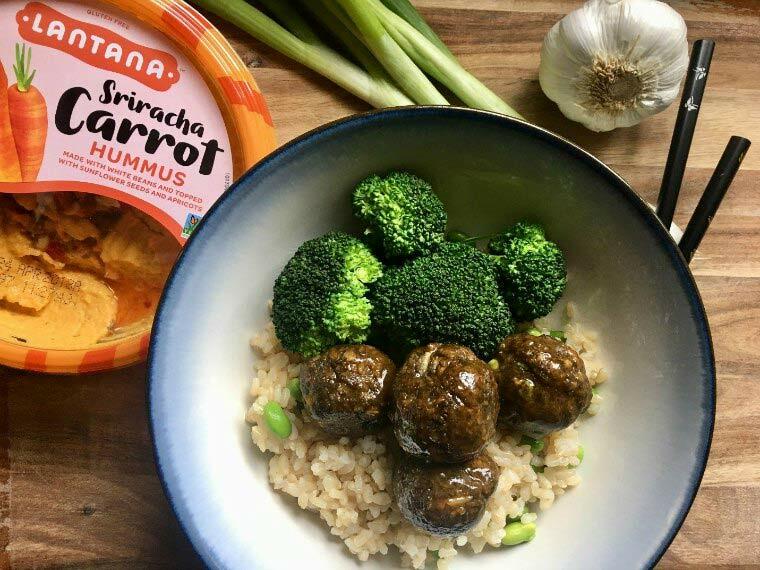 The other thing you might not realize about hummus is that it’s not just a great dip — it can also be awesome in a wide array of recipes, like this Sweet n’ Spicy Mushroom Meatball recipe from Austin-based company Lantana Hummus. Heat oil in a skillet over medium heat. Add mushrooms and salt to the hot oil and cook, stirring often, until liquid from mushrooms has evaporated, about 10 minutes. Add garlic and stir, cooking for 1 minute. Transfer mixture to a mixing bowl, stir in oats, and allow to cool. In a separate bowl, using a fork, combine remaining meatball ingredients. Mix well. Add to mushroom mixture. Form mixture into small meatballs, about 2 tablespoons each, and place on prepared baking sheet and bake until golden brown, about 12 to 15 minutes. While meatballs bake, combine all sauce ingredients in a medium size saucepan. Bring to a boil. Reduce heat to low and simmer for 8-10 minutes or until sauce thickens slightly. Combine meatballs with 1/3 of sauce mixture. Toss to coat. Serving Suggestion: Serve meatballs with brown rice, edamame and steamed broccoli, drizzled with remaining Apricot-Soy Sauce. I struggled a lot when I decided to eat healthier and be healthier in general, and recipes like this I thought I couldn’t eat but thankfully blogs like this show that we can eat things we consider unhealthy just by doing it in another way. Because I always felt tired so I got some extra help besides this fantastic and tasty recipes! I found very helpful the manifestation miracle it shows how to be healthy with vitality. If any of you want to know more about the program, I’ve taken the liberty to get you this link: https://bit.ly/2LtmWYr It helped me a lot!